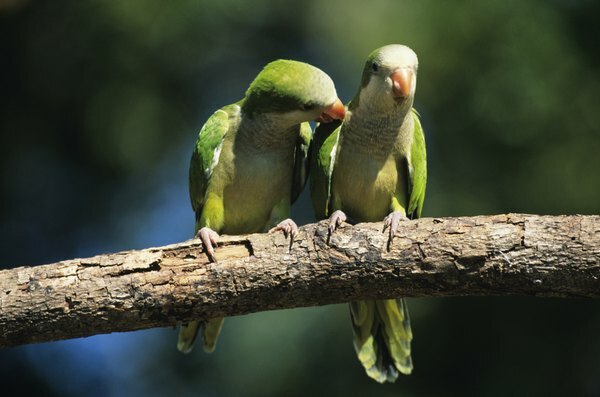 These wild Brazilian parakeets can handle the heat and cold in their native climate. Parakeets do well with modest temperature change but aren't tough enough to winter outside in most climates. Daily habitat plays a role in high- and low-temp tolerance. A bird kept in a temperature-controlled 70-degree Fahrenheit aviary will feel chilly if placed outside on a 40-degree day, for example. Parakeets do best with moderate temperatures and become uncomfortable in extremes of hot or cold, just like their owners do. Ideal daytime temperatures for these birds range from 60 to 70 degrees Fahrenheit, although budgies can withstand heat of up to 85 degrees without getting uncomfortable. These birds can handle a nighttime low of around 40 degrees. When temperatures fall below 40 degrees or exceed 90 degrees, a budgie will become uncomfortable. If they get too cold, parakeets may develop hypothermia; if they overheat, parakeets may suffer from heat stroke. While both conditions are potentially fatal, heat stroke is more serious. A parakeet can succumb to heat stroke in as little as 15 minutes, whereas hypothermia sets in over a period of days. To protect your bird's health, only let your budgie outside if temperatures fall within his preferred temperature range. If your budgie is overheating, he will pant and hold his wings away from his body in an effort to cool down. A cold bird will fluff himself up in an effort to retain heat and may remain fluffed up for a long period of time. In general, fatter birds are less able to handle hot temperatures because their subcutaneous fat insulates their bodies and compresses air sacs that allow for air flow. An overweight budgie will experience heat stress in cooler temperatures than a thin bird. Birds expel hot air through these air sacs to cool down. If you notice these signs, bring your bird into a temperate environment, such as indoors. If you would like your budgie to spend time outside in cooler or hotter conditions, begin by exposing him gradually to different temperatures. For example, if you would like your budgie to get some fresh air on a chilly winter day, take him outside for a few hours a day in early autumn. Continue to give him fresh air time throughout fall so that winter temperatures don't come as such a shock. As a rule, don't allow expose a budgie to a temperature change of more than 10 to 15 degrees in a 24-hour period.